Last Sunday, we finally managed to make it down to the Shah Alam stadium's morning market. I have been dying to go look at the place for quite some time but due to work commitments, it has been placed in the back burner. The place is pretty happening with a Pasar Tani (a kind of farmers market) with lots of local produce, food stalls and stalls selling second hand items. It is advisable to come early as it can get packed in the later part of the morning. Luckily, we reached here nice and early. We walked around the stalls - saw some interesting items. The meat stalls, has fresh beef hanging from racks. 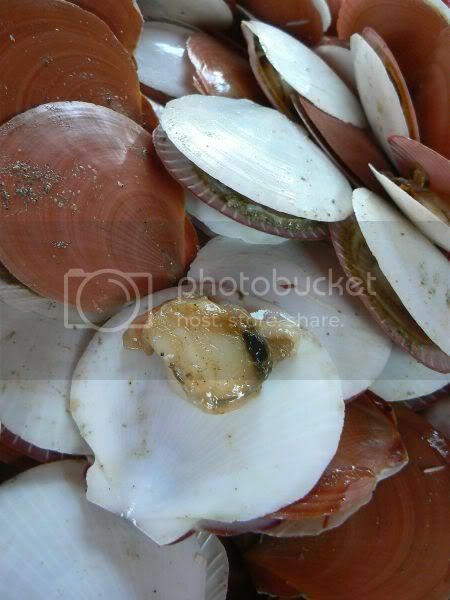 A lot of people were at the seafood stalls - fish, prawns and I even found fresh scallops. Only problem, was they looked a bit muddy. 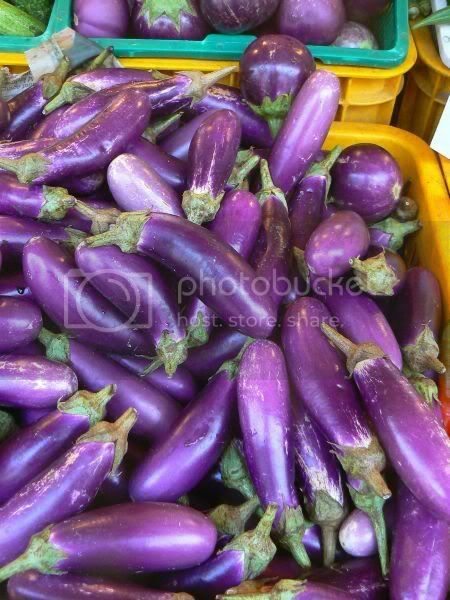 I guess you just need to bring them home, wash before you steam or cook them. I spied the workers cutting up a huge stingray. Didn't manage to snap a picture of it though. I didn't get any stuff, since we were due to go out for lunch. 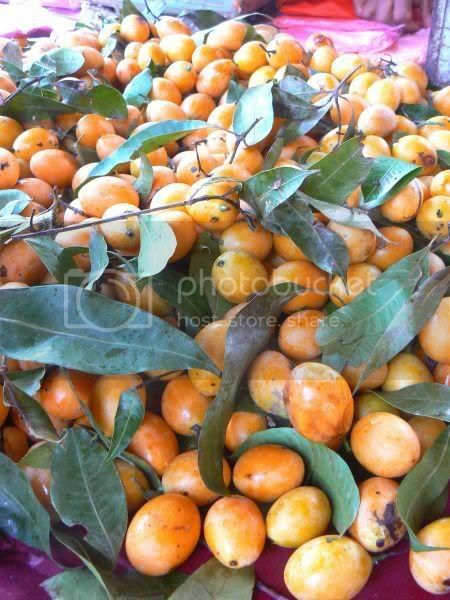 I saw a lot of kundang from Thailand being sold at the fruit stalls. Definitely very popular with people, as they were buying loads. Right next to the market, are the food stalls - about say 2 rows. They're basically a repeat of the Ramadan bazaar stalls, you can find around the same area. For instance, the popiah van was around selling SS Ali popiah, the stall selling akok (the Kelantanese delicacy), was also around. I even spied a stall selling Japanese dorayaki pancake, prepacked. For the food stalls, you get the nice option of dining there versus just packing back the food. Tables and chairs are set out behind stalls for you to sit. You can even order drinks, like coffee or tea too. 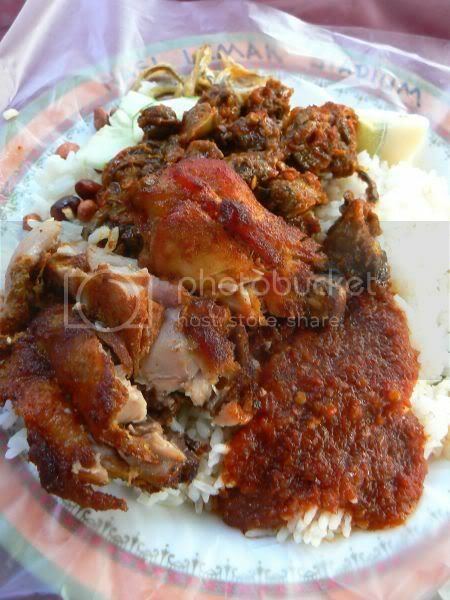 I took the opportunity to have my breakfast - nasi lemak. Called nasi lemak stadium, you choose from an array of dishes - cockles, fried chicken, fried egg, cow's lungs, rendang chicken and etc. Plonk whatever you like on the plate, pay and proceed to eat at the tables. The nasi lemak was so so, didn't think the rice texture plus the sambal was anything great. Kinda preferred the Kelana Jaya FAM one instead. 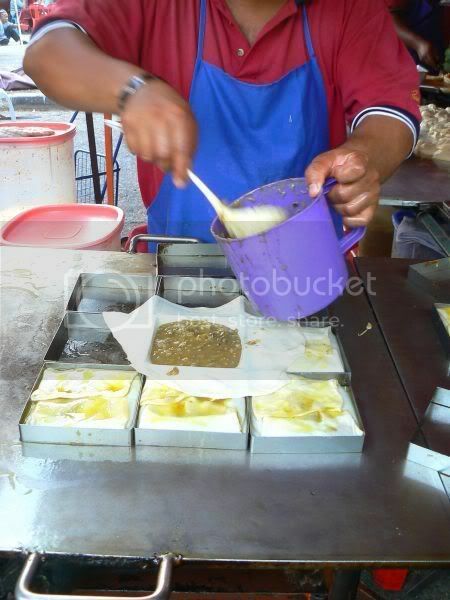 I did find one interesting stall - making murtabak in a slightly different manner. Instead of just a flat pancake version, this one was placed in a square mold. 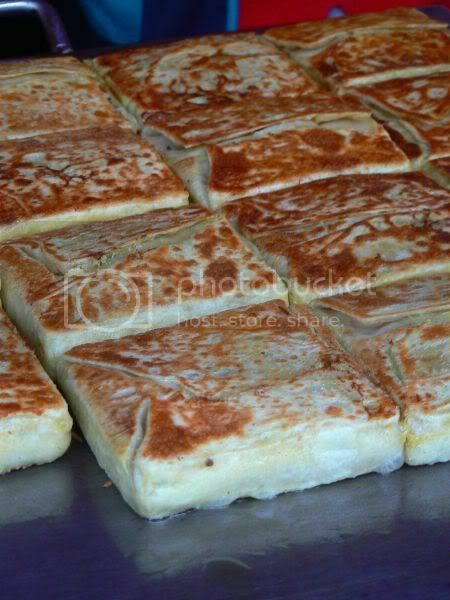 This seems to create a thicker murtabak, with lots more filling. 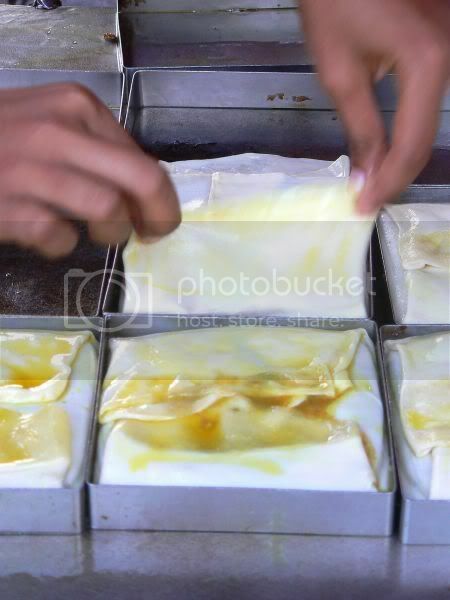 However, there is a price to pay, as it is about RM4, double of the normal murtabak you get. 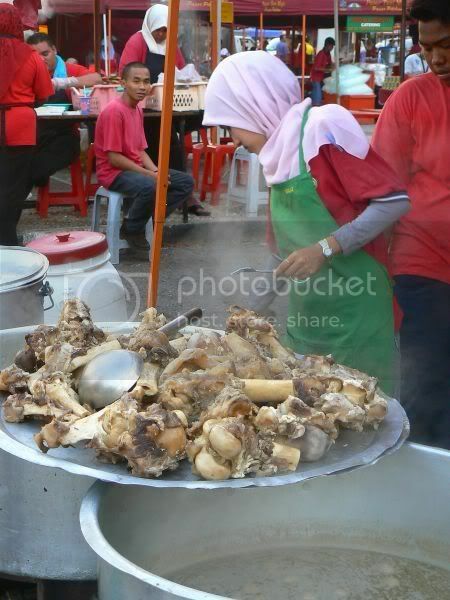 Aside from these stalls, there is ayam golek (in the morning! 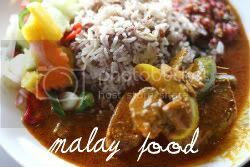 ), sup gearbox, laksam, nasi dagang, char kuey teow stalls and etc. Loads of variety that will keep your tummy happy. A short one for the beginning of the week. We were down at Pavilion yesterday for lunch, catching up with friends. It was extremely good fun. After lunch, we wandered around and I decided to go downstairs to try this particular tart as Paprika keeps raving about it. 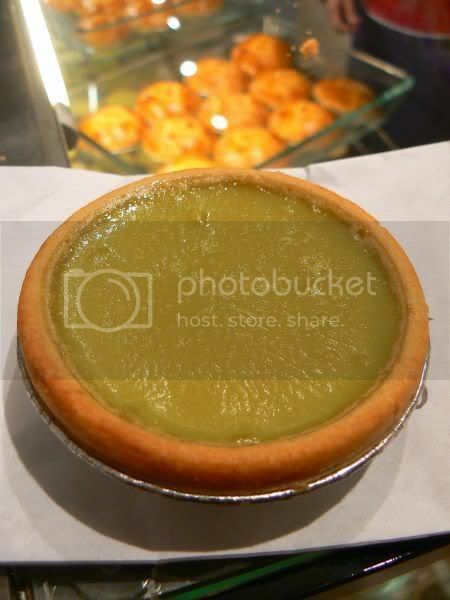 The range of egg tarts have expanded to include this Matcha version and coffee plus teh tarik. Managed to snap some pictures of the place, which I didn't get the last time I blogged about this place. 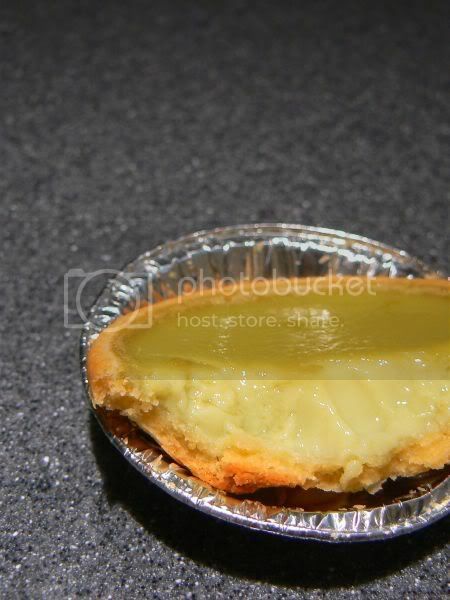 Conclusion on the tart - it was good, not very strong tea taste, a light cookie crust and very smooth filling. I tried a sliver of the coffee tart too, which I liked but didn't get any since Splashie Boy hates all things coffee. As usual, Food Republic was packed with people and there was the perpetual queue at J Co Donuts. Guess things don't change much over at Pavilion. Do drop by and give this place a try. Sorry for the long silence - been busy plus the photo uploading has been acting up. 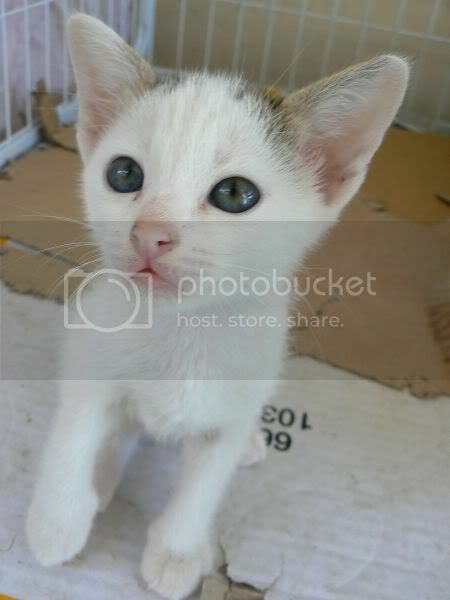 Using my flickr account for this versus photobucket since it was unaccessible. 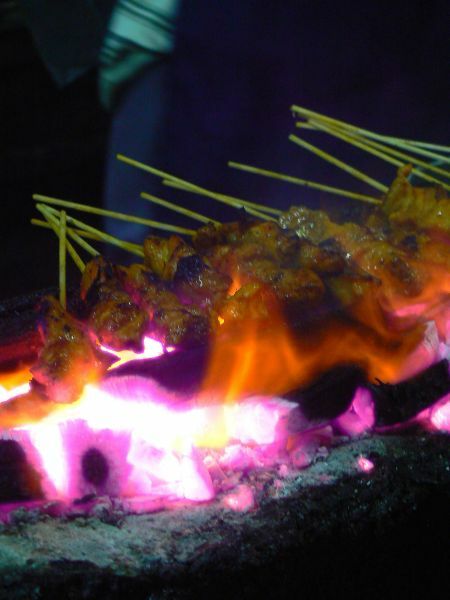 Been a while since I blogged about Malay food, so here goes - yummy satay at the Datuk Keramat area. It may be far, but definitely worth it. Pretty easy to get here from MRR2. 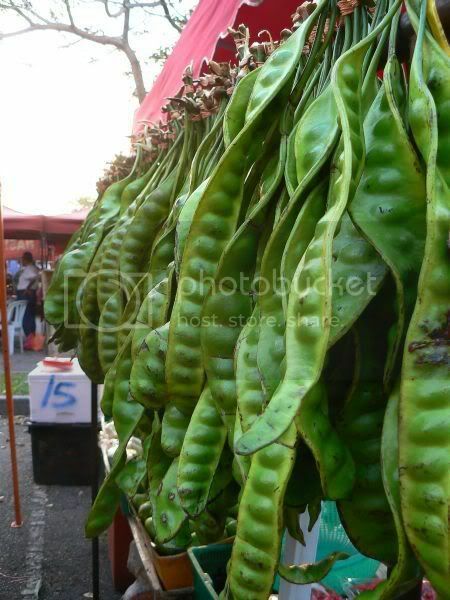 The stall is located at a medan selera near the Petronas station. It is the corner stall and packed with people waiting for their satay. 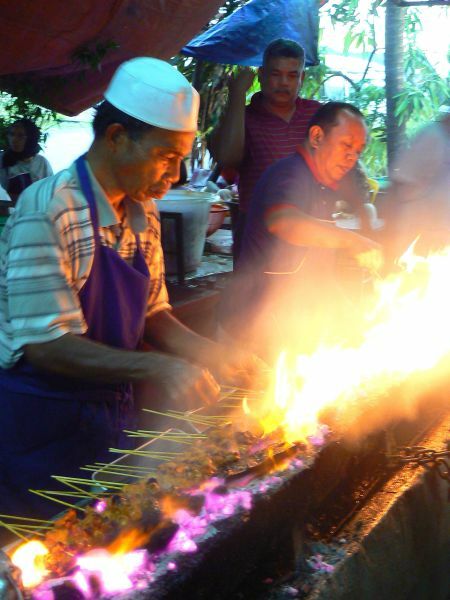 Walk to the back and you'll find a hive of activity - long rows of hot charcoal grills where sticks of satay are being grilled. 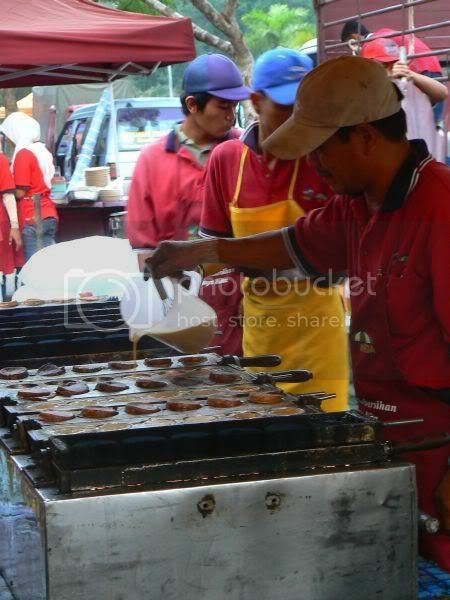 Reminds me of a mini satay factory, the way they were churning out the satay. 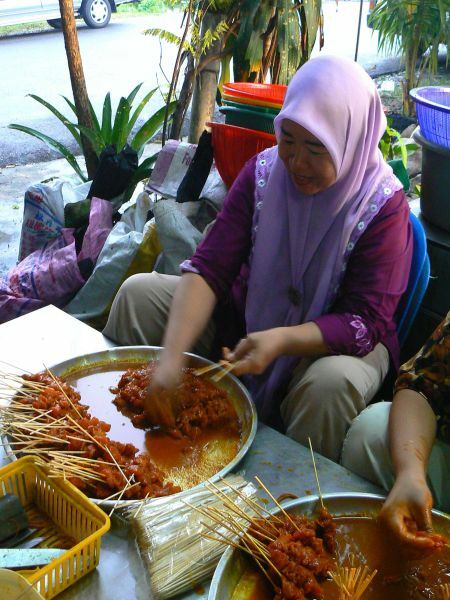 Aside from the grilling, the ladies were at the back, preparing the satay sticks and marinated meat. Three types of item found - chicken, beef, cow's liver and tripe. 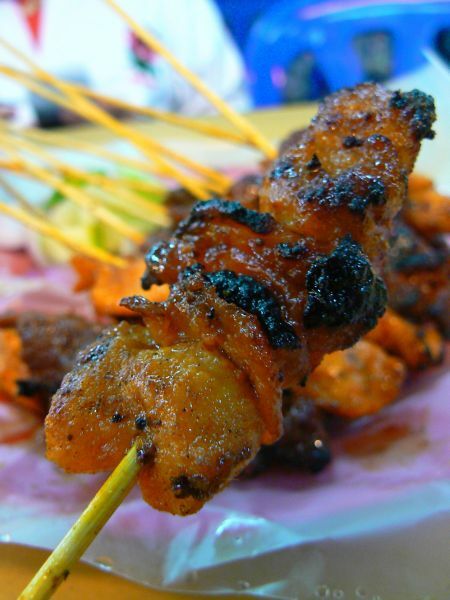 The chicken and beef satay is 60 sens, while cow's liver (hati) is 70 sens and the cow's tripe (perut) is 80 sens. 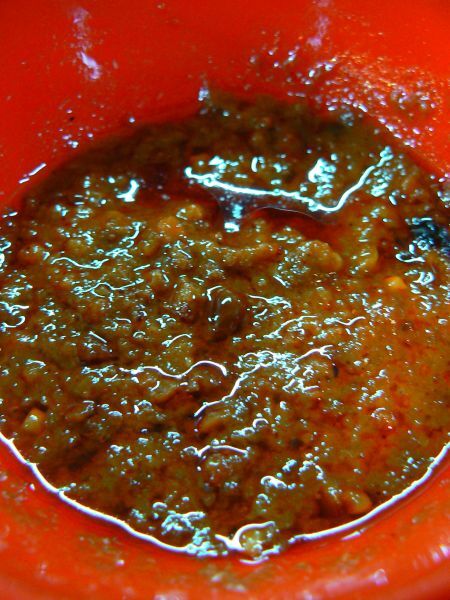 Everything comes in chunky bits and peanut sauce with sambal. 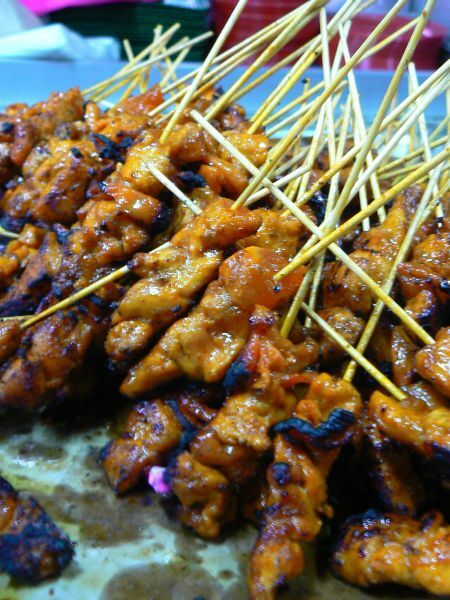 I liked the tender chicken and beef satay. Very yummy especially with the sauce. 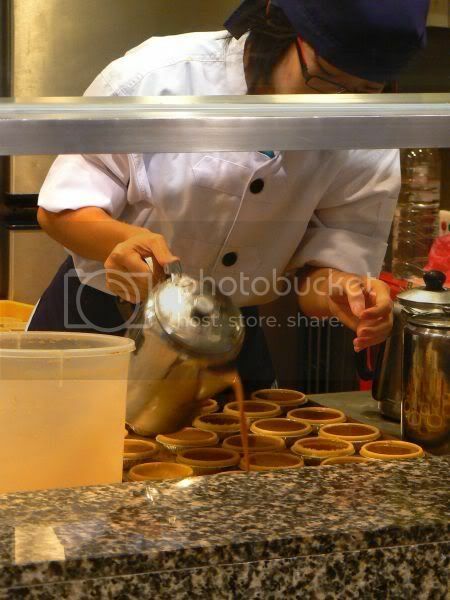 And you must order their Leng Chee Kang, a huge bowl of ingredients for RM2.50. 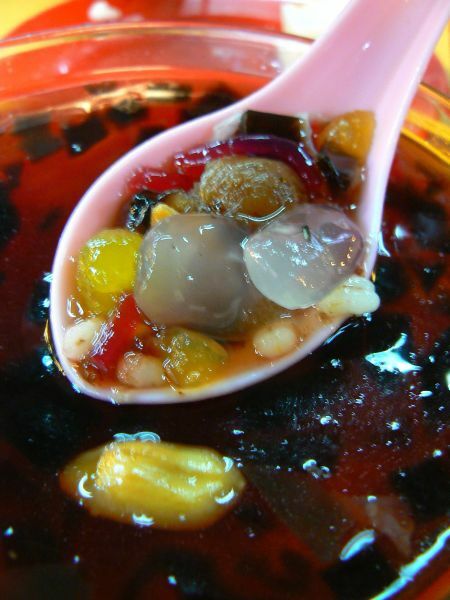 It had peanuts, atap chee (palm seed), cincau, longan, barley and etc to keep me very happy. We were early that day but I reckon when it approaches dinner time, it would be packed with people eating or just taking away. This year round, we decided to celebrate Valentine's Day a bit later i.e the day after. I'm not a fan for the commercially over-priced set meals during the "day of romance" and prefer, if the money was better spent on great food instead. We took a gamble on this place, which came highly recommended. A real hole in the wall restaurant, it is how I like my Japanese restaurants to be - tiny, smoky, no frills, with tatami rooms and most importantly full of Japanese customers. 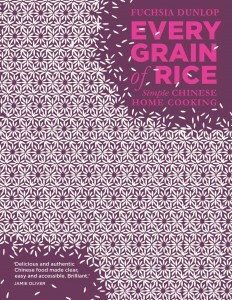 My belief when it comes to any cuisine, it must be good enough for the locals to eat there i.e. 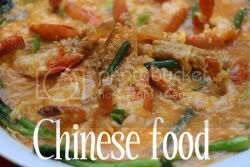 if you're in Australia, I'm sure you will have more confidence with a Chinese restaurant filled with Chinese people? I've read about this place's amazing Omakase (i.e chef's choice, where you pay a fixed prixe per person and they serve you, course by course of their best and freshest) from the latest issue of Klue magazine. Since the description, perked my curiosity, I knew what I wanted to try here. 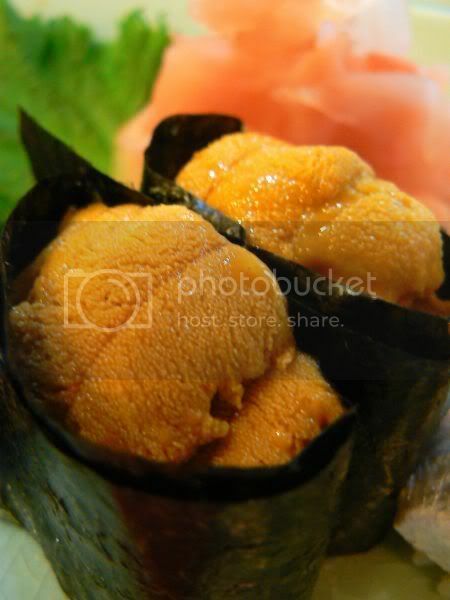 A quick check with the restaurant indicated that Omakase was recommended on Tuesday and Friday, when the fish was the freshest, since those are the days they arrive airflown from Japan. We booked a table for Friday night, in the hope that we will manage to brave the down town traffic and the roadblocks. Communication over the phone, wasn't too good as most of the waitresses don't seem to speak English very well......so do be extra careful. It was quite weird as they cancelled my booking but when I called them to tell them I would be late, they gave me back my booking. Sigh! It would have been diastrous if I had lost my booking. It took us a while to figure out Federal Hotel since we haven't been for ages plus we had used the back entrance versus the front. Finally located the place which is near to Yi Qi. It's much easier if you come from the front entrance. The restaurant is not managed by the hotel, but occupies a small space at the hotel's arcade area. Once we kicked off our shoes, settled in comfortably at our tatami room, it was all systems go! I reckon it must have been hectic, before we arrived as we saw groups of Japanese men leaving, when we stepped in our tatami room. Omakase seems to be the "in" thing here as everyone had the same stuff on their tables. 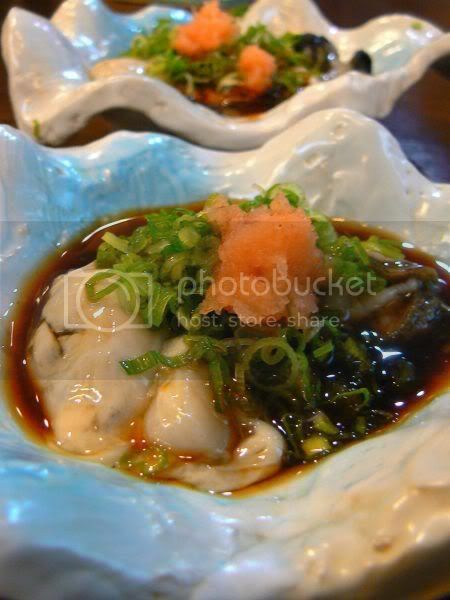 We started off with oysters served in a pretty bowl resembling an oyster shell. On the surface, it looked like a single flat oyster. I dug in with my chopsticks and found 2 juicy and fat oysters. Incredibly fresh, they tasted so good with the soy sauce topped with spring onions and a mix of shredded daikon radish and chili. Food arrives pretty quickly once you complete the course. 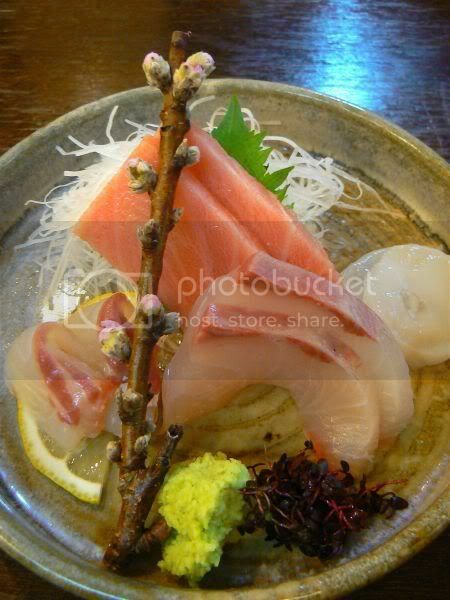 Next was our sashimi platter - two pieces of melt in the mouth toro (tuna belly), two different parts of hamachi (yellow tail) and octopus (tako). I really enjoyed the thickly cut toro with soy sauce and the red cress. 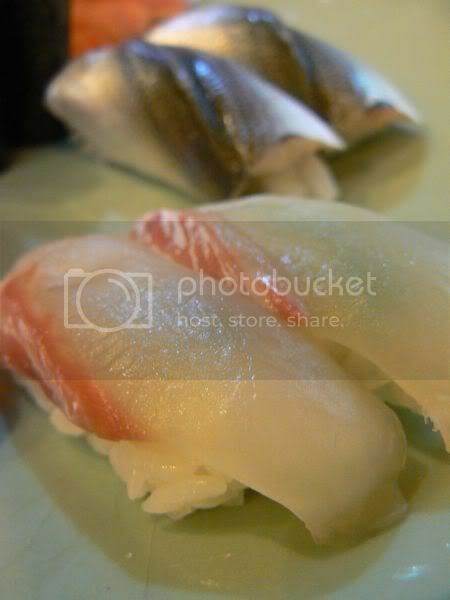 By the way, I'm not too good with identifying the fish so it could have been kanpachi versus hamachi. Sigh! do advise and I'll amend accordingly. 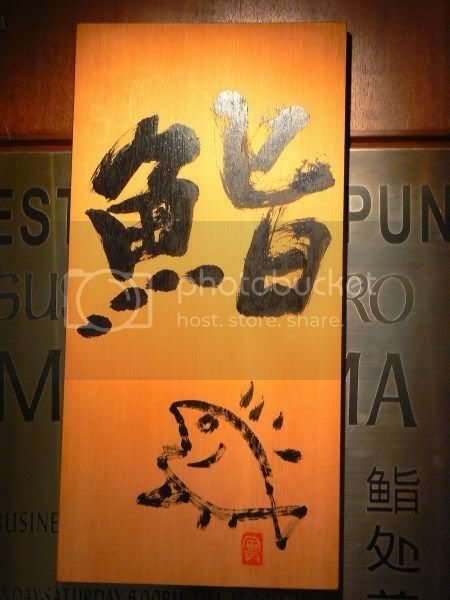 Next it was a plate of grilled fish, which we have not seen before. 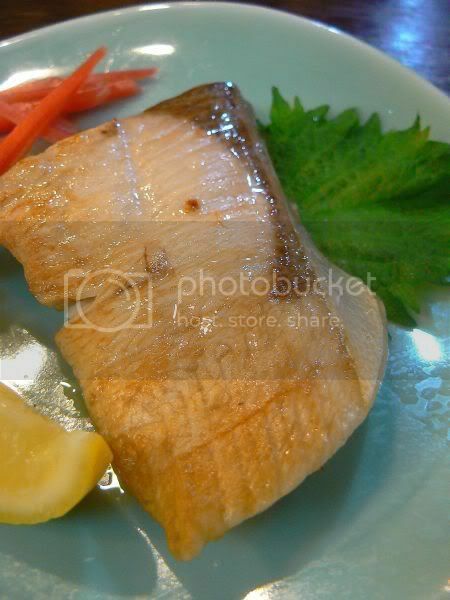 A quick check with the waitress confirmed it was called Buri, a type of yellowtail fish. We ate with grated daikon radish with soy sauce and ginger. 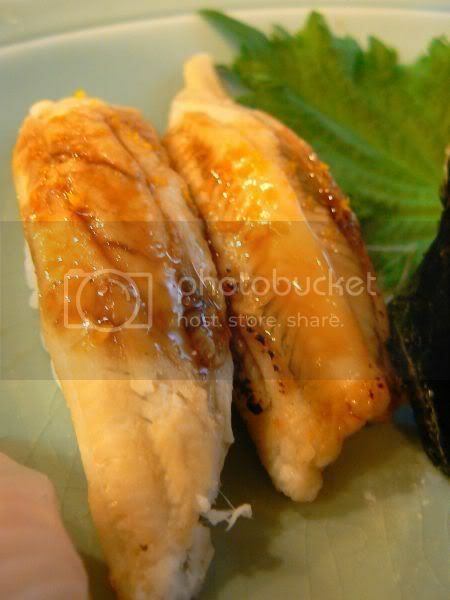 Juicy and moist, I liked the fresh taste of it with the grated daikon radish. I liked how everything was served really quickly once we finished each course. 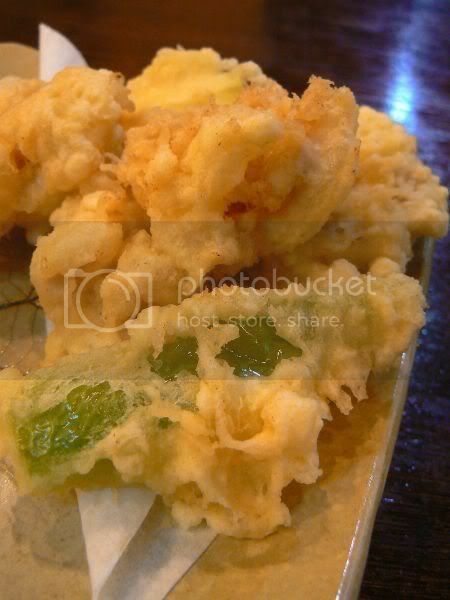 Next was an ordinary looking assorted tempura - eggplant, lotus, Japanese green pepper and a type of fish, which I could not name. 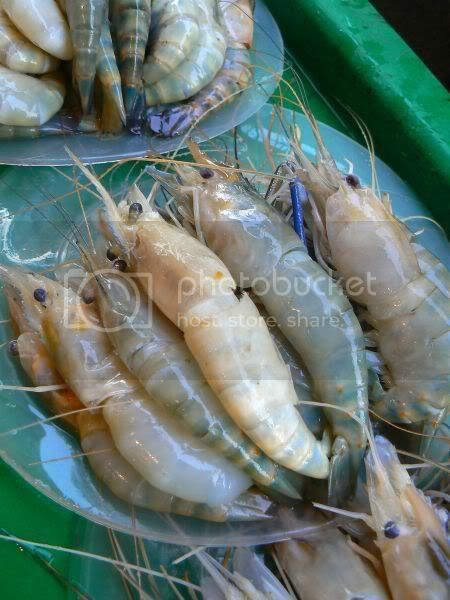 It had the soft texture of oyster, with no fishy smell. Nice stuff and I was glad they gave two pieces. The lotus was very different - thickly sliced and much more substantial, I felt than the local varieties. 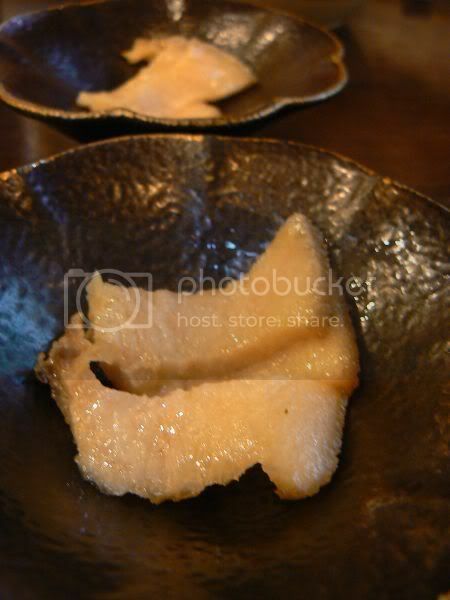 By this time, I was feeling pretty well satisfied so I was astonished to see bowls of thick slices of what looked like fat pork belly. We quickly asked the waitress and she indicated it was tongue but we had no idea what animal. After a few hand gestures, we figured out it was whale (saezuri in Japanese)! Very politically incorrect but we had told them, we were game for anything so we decided to try it. The texture is quite fat and slightly chewy. A bit tasteless, it had to be dipped in soy sauce. Wouldn't say I liked it a lot but it was definitely an eye opener. 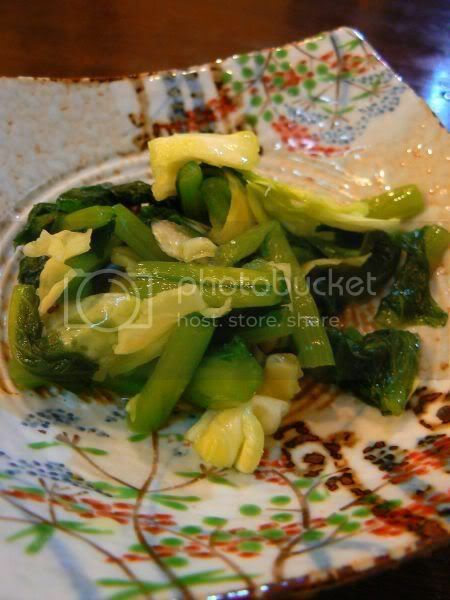 To accompany our weird dish, we were presented with a pretty flowered plate topped with a mix of vinegared vegetables. 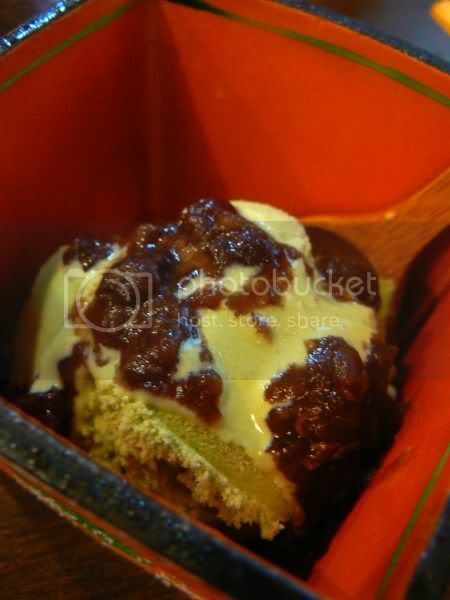 It had a refreshing taste with a tinge of wasabi at the end for extra kick. 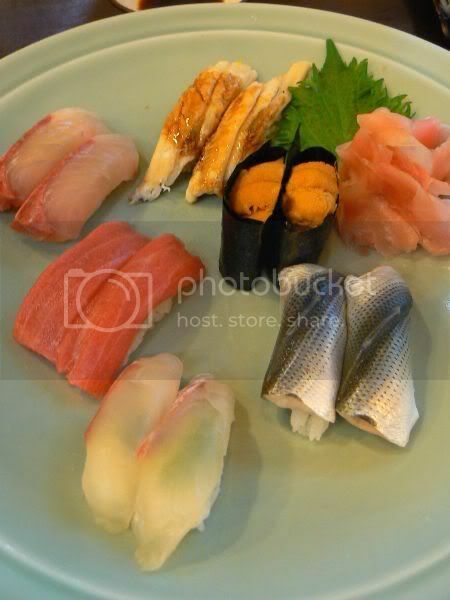 Finally, it was the nigiri sushi platter with a bowl of akadashi soup. 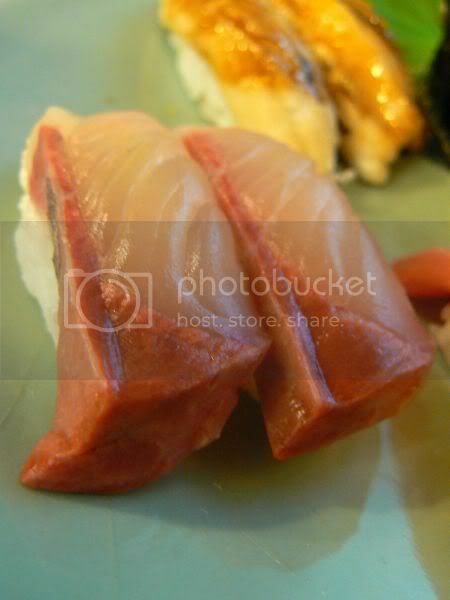 The platter was huge and the fish was sliced so thick, they literally covered the rice that at one glance, you would not have figured it was nigiri sushi. I had a quick peek at the menu and wouldn't mind returning to try the other items - kobe beef, tea rice, sashimi, sushi, menrui (noodles) and etc. 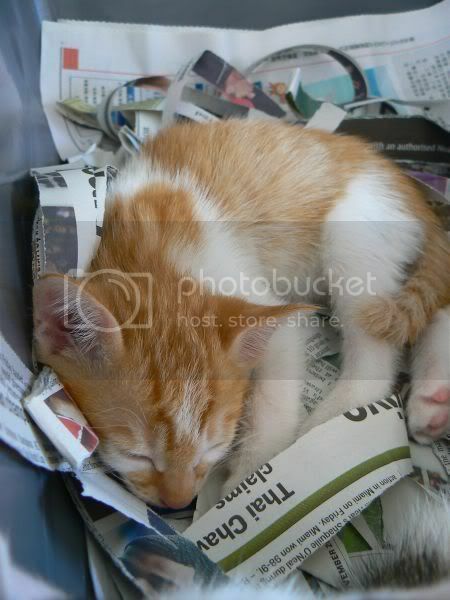 We have been busy during the weekend, hence no pixs of the kittens until now. They have grown up a lot since I posted pictures. Now they love to play play play! As rough as possible as 3 of them can get into a lot of mischief. Topmost on their hobby list (besides drinking mum's milk) is climbing the cage. They have also discovered mum's dry and wet food bowls plus started drinking water on their own. Their eye colour is still blueish but I reckon it will change after a while. They're pretty sweet and adorable. 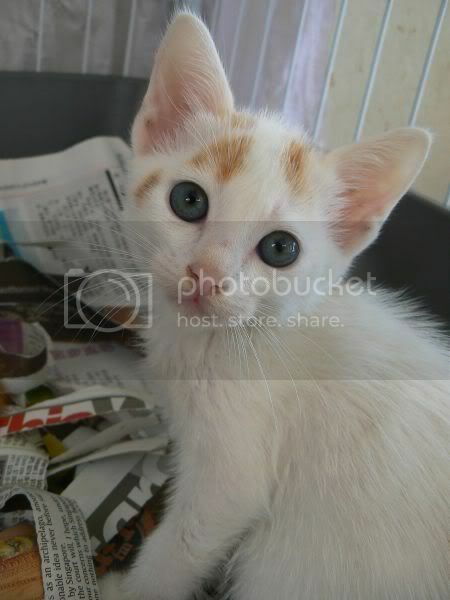 If you know of a good home for them, do email me at boo_liciouskl@yahoo.com for details. Thanks so much. Samantha Black and Tigger are hosting WCB this weekend. Hop over to Life from a Cat's Perspective. Strangely enough when I first encountered the food at D'lish, I wasn't very impressed. However, after a few times of trying more menu items, I slowly discovered yummy stuff there. For us, we tend to dine here, when we want something quick especially before some grocery shopping at Village Grocer. It's also a relatively quiet here vs the more happening Delicious at Bangsar Village II. 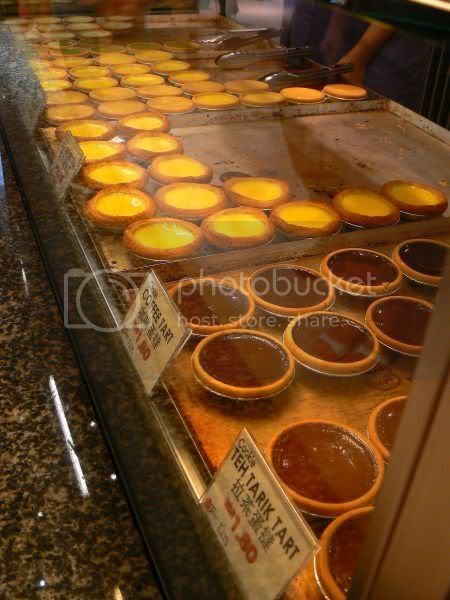 You select pre-packed items behind the glass counter and they will reheat it up. Alternatively, you can pack back the items. Various opinions about this place - some love it while others hate it calling it not worth it for the price you pay for. 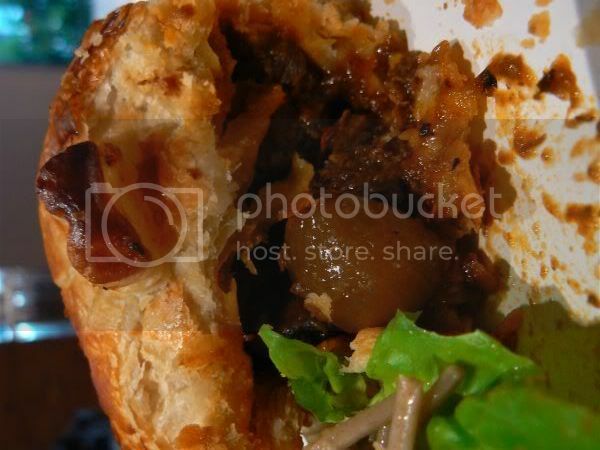 We tend to go for their pies here especially the Lamb Shank Pie. Sorry no prices yet as I need to go search for it. 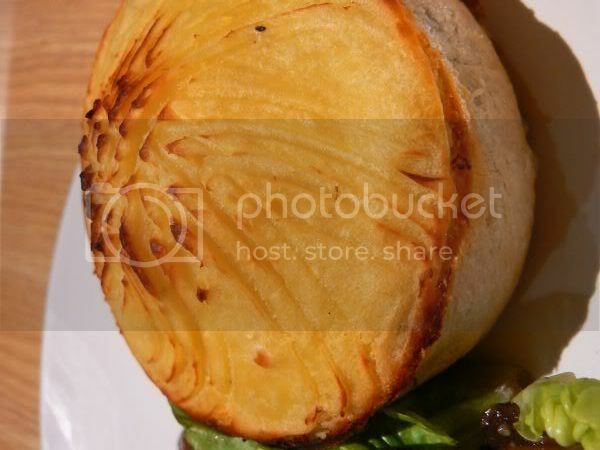 Back to the pie - we both love the generous lamb portions under the bed of mashed potato. Very good value we reckon. Been introducing this pie to everyone I know, so far only one person has complained saying the lamb meat has a slight unpleasant taste. Not sure if that is just one off day since my other friends didn't have any other complaints. Even my friend from London loved the pie. 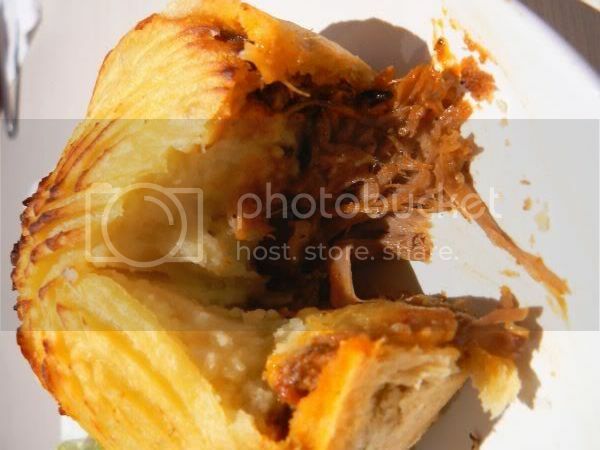 I'm not too enthusiatic about the wagyu beef pie covered under a flaky puff pastry. Although the beef cubes are tender, it seems to lack much flavour. 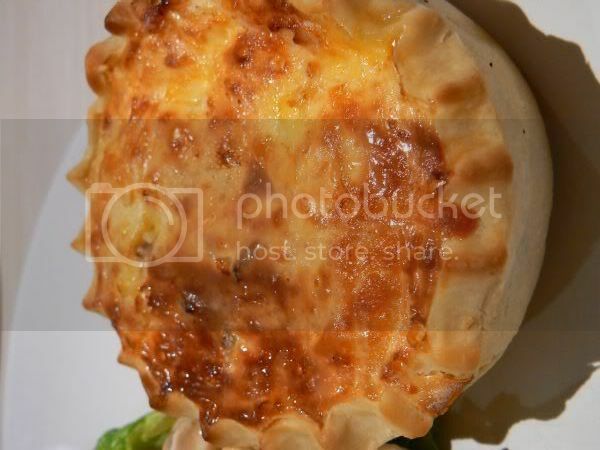 All the pies and quiches have an option, that allows you to add a side salad. 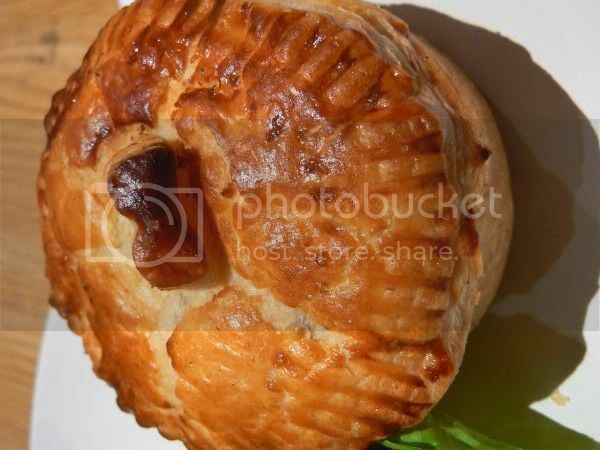 I believe the price of the pie is around RM5 to RM6, while adding on a salad is around RM4 to RM5. 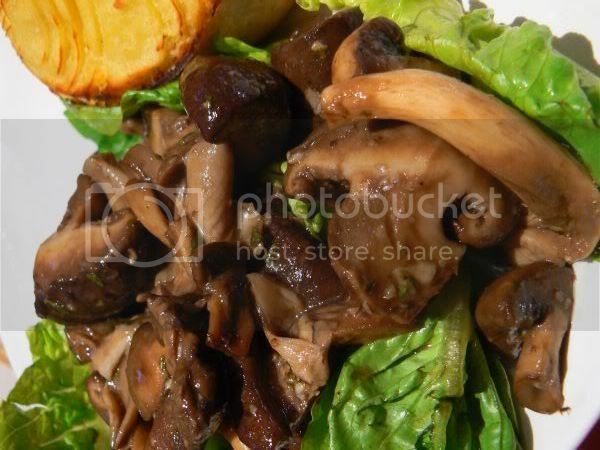 Just select from an array of salads - balsamic mushrooms, soba noodles, thai beef salad, vietnamese peanut salad and etc. Out of all the salads, my favourite one is the thai vermicelli one with beef slices served with a tangy dressing. 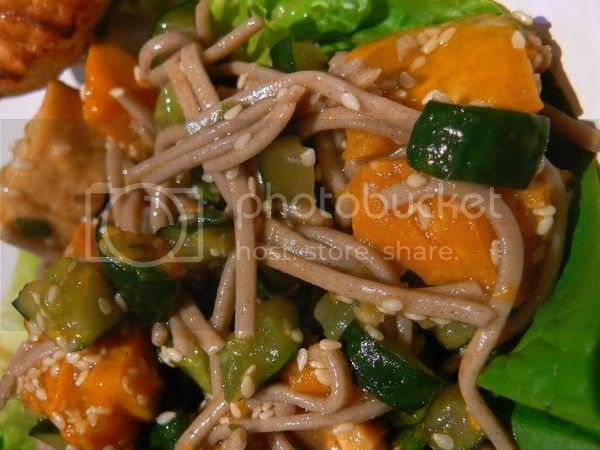 The balsamic mushrooms can be a bit too sour while the soba noodles a bit soggy. 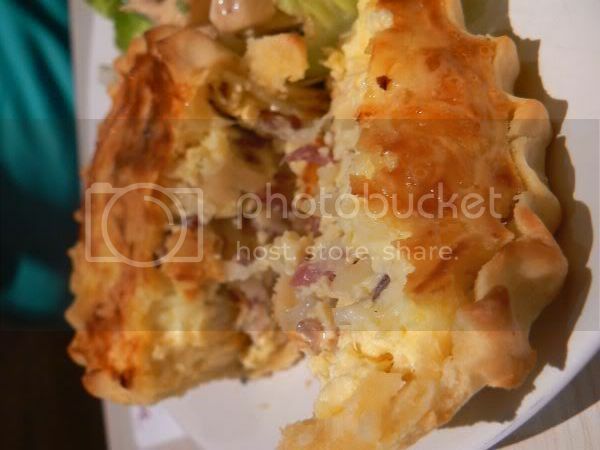 The quiches are also pretty substantial with the bacon version tasting much better than the roasted vegetable version. When it first started out, I had the smoked salmon sandwich while Splashie Boy ate their roast beef sandwich, which was not bad but didn't wow us much. Heard good things about their sausage roll and they have a roti jala sandwich, where the chicken curry is wrapped within. I also love their cauliflower soup - creamy and substantial with cauliflower florets. No pictures of desserts as we tend to eat them quickly before I get a chance to snap. I don't really like the huge butter cupcakes they have. Everything about it tastes very artificial. Instead go for the chocolate ganache one with marshmallows. 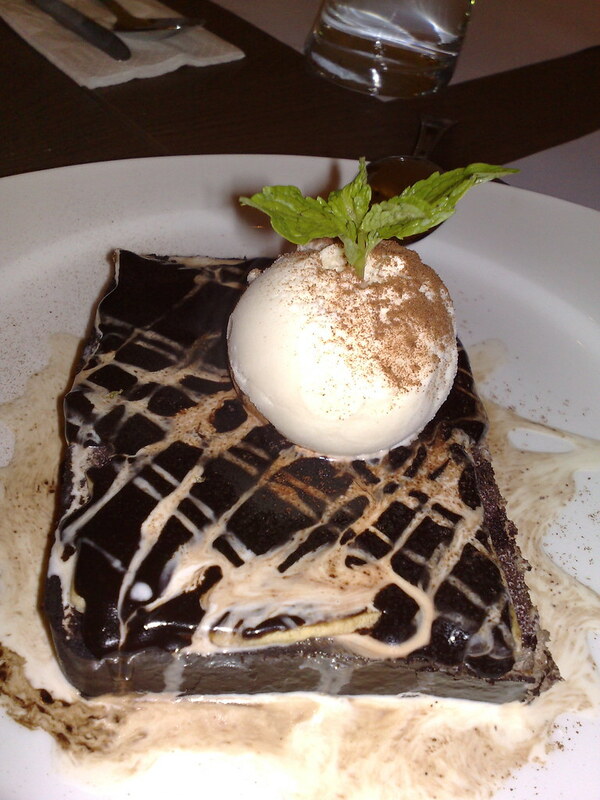 They heat it up for you and it tastes great warm with the melted chocolate on top. Splashie Boy's favourite is the banana cupcake with butterscotch frosting - not too sweet and with a distinct banana aroma. I recently discovered something about D'lish. Not sure if it is common knowledge but everything is 50% off after 9pm. We stumbled on this when we were late for dinner and was curious why the usually quiet place was packed with people. Everyone kept eyeing the food (kept behind glass counters) and was buying tons. After paying and checking the bill, we discovered the discount. Definitely made the meal worth it since everything was so reasonably priced. If you want to enjoy the discount, my advice to you is get there early and grab your stuff or else others will move in on it quickly. I had to change my order a few times as people kept taking what I wanted. 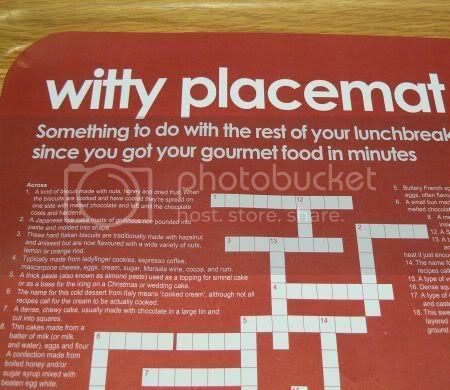 Another thing I love about this place are the witty remarks on their food labels, placemats and etc. It is also a good place to dine alone as you have a row of televisions to entertain you. There's even a crossword puzzle you can do while waiting. My friend's son had fun doing that when he was back from London. I thought I'll share with all of you something new I have been playing with - the Nokia N82. Recently launched, the phone is amazing - super fast versus my slow N73 and best of all, I love the handy camera phone. I used to think my N73 took great pictures but after playing around with the N82, I know better as it's 5MP with a Xenon flash. 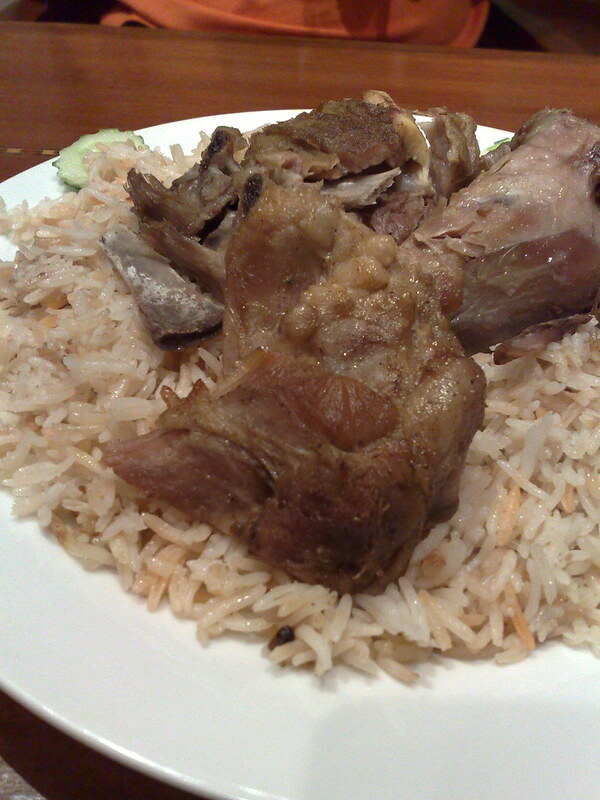 To be honest, I often find myself snapping pictures of food with the camera phone nowadays versus my Lumix. It works better in low light since the flash is really good. Another great part is the GPS. Not only am I keying in data for the maps, I also get to look up directions. Very handy especially if you get lost. I used it to get to this godforsaken place in Section 25, Shah Alam, which I would not have found at all by myself. Nokia is kicking off the launch of this phone with an interesting website known as the Soul of The Night, which I am honoured to take part. 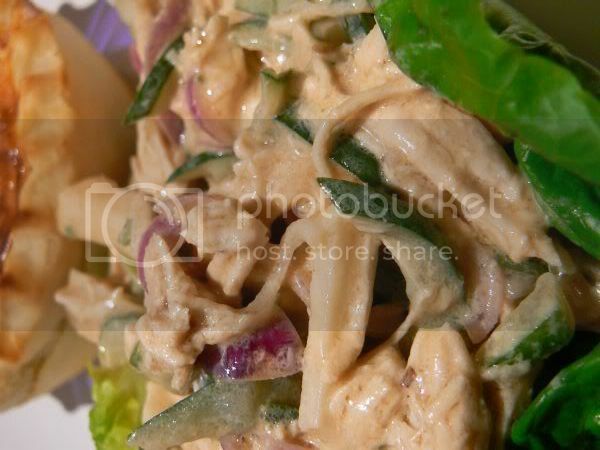 As a carrot for all of you to check it out, here are some preview pictures of the places not on the blog before - the new Yemen place on Chulan Square known as Hadhramawt Restaurant and a really great Italian place at Jaya 33 called d'italian kitchen. Do check out the site and sign up once registration opens on 12 February, 2008 to take part. It's great fun since you get to check out all the nightspots in town - whether it's the nightclub, great food or just a place to hang out. Have lots of fun! P/s there's a bonus post for those who love burgers - the Medan Selera SS2 burger stall, which serves yummy prawn burgers.